SAAFoST is offering time slots in the Product Theatre where the opportunity exists for companies to showcase their unique application solutions. Cost to secure a 30-minute slot is R3 500+VAT for exhibitors and R5 000+VAT for non exhibitors (see booking form for time slot options). 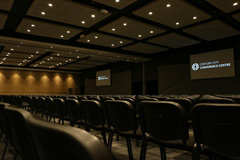 The venue will be meeting room 2 at the Century City Conference Centre, seating approximately 35 people. via a notice in the exhibition hall "Today's/tomorrow's presentations in the Product Theatre." For more information, or to book a session, please contact Jacques van den Berg (jvandenberg@coca-cola.com) or Rosie Maguire (rosie@inessence.co.za). Please note that only 22 time slots are available. On-screen advertising slots are available in the large plenary venues (auditoriums 1 and 2) at a cost of R5 000 (excl VAT) per day. These screen slides would be viewed for 10 secs every minute during lunch and tea breaks (not during presentations). A maximum of 6 slide spots per day are available.